"Aladdin’s Treasure" is an exceedingly basic hi lo game that over-compensates for it’s lack of innovation with ridiculous graphics. 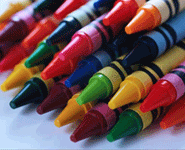 The game looks as though 50 school children were told to go to town on it with a set of crayons so vivid that they came with a serious health warning. The jumbled mess that is the Aladdin’s Treasure hi lo game board is a vicious assault on one of my favourite senses, and the orders were clearly "shoot to kill". I’m all for pretty colours, but not all of them at once. I like profiteroles, sundaes and apple crumbles too, but we’re all fully aware of the dire consequences of such a combination in one sitting. In fact, the likely outcome of such a stomach-churning feast looks a lot like the design of the Aladdin’s Treasure game board. Do yourself (and your poor eyes) a favour and play HiLo Gambler instead. After you’ve figured out where it is you’re supposed to click to get the game started, you’ll find that the actual format of Aladdin’s Treasure to be quite disappointing. All you have to do is guess hi or lo on a fixed number between 1 and 20. That’s the long and short of it. You may get rewarded with a 5% or so bonus along the way, but that’s as far as the variety goes. 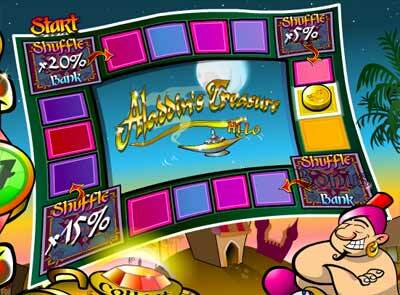 Aladdin’s Treasure also seems to enjoy rubbing in losses by not allowing you to quickly move on to the next game. Instead, you are reminded of your failure for a good 5 seconds before having the opportunity to start over again. Thanks for that. To be honest with you, I’d rather play Laser Escape instead. Guess hi or lo on a number between 1 and 20 and move along one square if you guess correctly. Pick up a "shuffle" and a percentage bonus at certain intervals on the game board. Collect or gamble your winnings at any time. It’s nice that you have some actual goals to aim for in Aladdin’s Treasure, but that doesn’t make up for the incredibly simple hi-lo guessing game format. Aladdin's Treasure in more detail. The game of Aladdin’s Treasure is orientated around the squares on a simple game board. The aim of the game is to move as far around the board as possible by correctly guessing higher or lower on a random number between 1 and 20. For every correct guess you make you will move one square across the board. The win-multiplier for correct guesses varies depending on the starting number, where more difficult numbers and less likely outcomes will have larger payouts. Your winnings are accumulated as you move around the board. 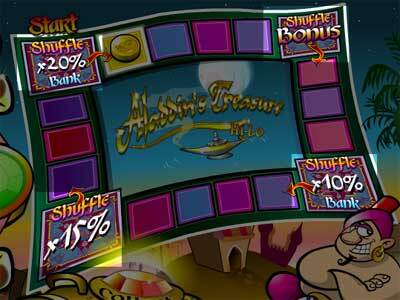 If you manage to reach a corner of the Aladdin’s Treasure board you will be rewarded with a "shuffle" and a small bonus that will increase your current winnings by either 5%, 10%, 15% or 20% depending on how far you’ve made it around the board. Fact: If you make it to the second or fourth bonus square you have the opportunity to bank 10% of your current winnings before moving on. 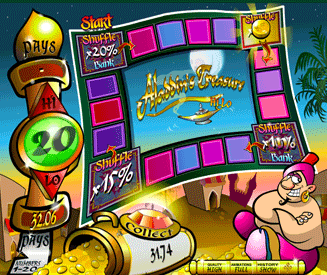 You can collect your winnings at any stage of the game, or you can choose to gamble them to move further around the board and win more money. The payouts for Aladdin’s Treasure vary depending on the starting number and whether you choose to go higher or lower on that number. Note: Remember that the numbers in Aladdin’s Treasure range from 1 to 20. You cannot go lower on a 1 or higher on a 20. If you manage to make it to one of the corners on the board you will be rewarded with a bonus. The bonuses get bigger as you make your way around the board. The bonuses arrive in the following order. 5% bonus after 5 correct guesses. 10% bonus after 9 correct guesses. You are also have the option to bank 10% of your winnings before continuing if you make it to this square. 15% bonus after 14 correct guesses. 20% bonus after 18 correct guesses. Another 10% bank option is available here too. On each bonus square you will also be rewarded with one "shuffle", which gives the option of shuffling your current number for the chance of getting a better one.